Harold and Nancy Rhee interviewed Marie for their newly launched podcast, This Is Pawprint. Marie tells her story, and shares some marketing tips for animal rescue groups. Click here or the image below to check it out. Marie is featured in a commercial for Adobe Slate, which showcased her social media work for Muttville Senior Dog Rescue. Read more here. Watch the commercial below! The Grey Muzzle Organization features Marie and Her Muttville Fospice Dog: "Muttville's Danny Boy: Bringing "Bark-It" List Joy to Hospice Dogs"
The Grey Muzzle Organization contacted Muttville to contribute a piece for its Grey Matters blog series. Marie's own experience caring for a dog in Muttville's Fospice Program peaked their interest. Here is the story about Danny Boy, a hospice dog with a Bark-it List to fulfill, who brought joy to the humans in his life, as well as other hospice dogs. Marie participated in the photo shoot and interview, representing Muttville Senior Dog Rescue . Read A.R.M. 's article about the the fun campaign. March 2013: Article published in Dogster.com: "A Three-Legged Dog from Iran Makes It to California for a New Home -- And a Set of Wheels"
Grouchy Puppy chose Marie for its "Influencing Positively" series, honoring individuals making a difference in the animal rescue community. Read the interview here. Marie was interviewed by Hassina Obaidy to discuss her experiences in fostering and hospicing special needs dogs for Muttville Senior Dog Rescue. The article addressed the sensitive topic of euthanasia. 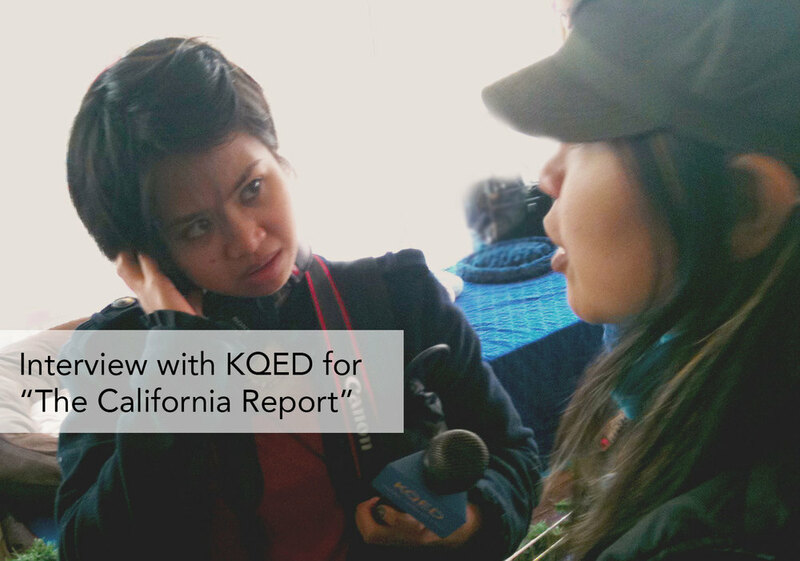 November 2012: Interview on KQED / NPR show, "The California Report"
ALSO: read the behind-the-scenes story of Marie's exciting day. April 2012: Interview for The TechSoup Blog: "Moments in Mobile – Featuring Muttville Senior Dog Rescue"
TechSoup's Online Coordinator Alexandra Bezdikian interviewed Marie for an article about the growing importance of mobile marketing for non profit organizations. 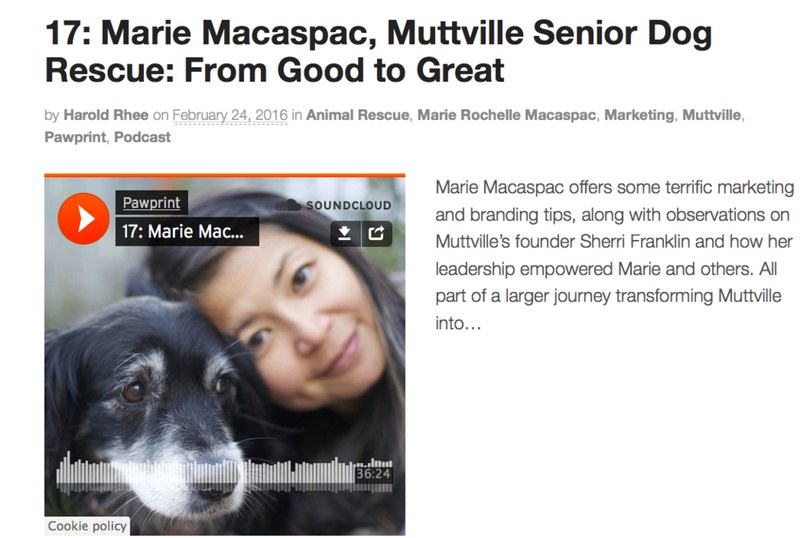 "Marie Macaspac is the marketing wizard behind Muttville Senior Dog Rescue’s mobile strategy." Read the article and watch Marie's interview here. May 2011: Interview with Don Bleu on KIOI Star 101.3 on "Muttville Day"
Don Bleu interviews Muttville founder Sherri Franklin and Marketing Director and foster mom Marie Macaspac on the morning of “Muttville Senior Dog Rescue Day” in San Francisco. Click here to listen to the interview with Sherri Franklin and Marie Macaspac. A blog post written by Switchblade Creative Studios & AnimalRescueMarketing.com founder, Marie Rochelle Macaspac, it originally published for Muttville Senior Dog Rescue on April 2, 2011 called “What Muttville Means To Me: The Story of Collette”, and then it was picked up by Bella Dog Magazine for their Summer 2011 issue. They featured a full spread for Muttville, also portraying founder Sherri Franklin and the work Muttville accomplished in their first four years. Marie was interviewed and featured in this video produced by University of San Francisco student Rachelle Phillips about Muttville. June 2009: Article for SFGate.com's Tails of the City - "Animal Welfare Spotlight: Muttville"
Marie was included in this interview published by SFGate columnist, Amelia Glynn for her column, "Tails In the City". Read the article here.